Despite having been brought down by the recessions in Russia and Ukraine, the 2016 outlook for Eastern Europe is positive. The regional GDP is forecast to grow 1.1% in 2016, mainly led by Poland. In the countries surveyed in Eastern Europe (Czech Republic, Hungary, Poland, Slovakia and Turkey) business conditions are varied and the insolvencies landscape is mixed. This offers interesting insights into the payment practices of businesses in the region. As observed in Western Europe, respondents in Eastern Europe also appear to be more inclined to request payment methods from business-to-business (B2B) customers which do not expose them to payment default risks, than to use payment methods that do expose them to these risks. Although selling on cash terms may result in lost sales (if the buyer really needs the flexibility of credit terms), most of the respondents in Eastern Europe seem to prefer this approach, particularly when it comes to foreign trade. On average, 42.9% of survey respondents’ domestic B2B sales were made on credit, and 57.1% were transacted on a cash basis, or in terms other than trade credit (averages for Western Europe: 44.8% credit and 55.2% cash). As to foreign B2B trade, credit-based and sales on cash terms averaged 36.6% and 63.4% of the export sales value (averages for Western Europe: 37.7% credit and 62.3% cash). The most conservative approach to the use of trade credit in B2B transactions is shown by Slovakian respondents (26.7% of the B2B sales value was made on credit). Hungary, in contrast, appears to be the most trade credit friendly country in the region (53.6% of B2B sales value was made on credit). In the other countries surveyed, the average total value of B2B sales on credit ranges from 33.9% in Poland to 44.3% in the Czech Republic. Of all the countries surveyed in Eastern Europe, Turkey shows the strongest preference for selling on credit to domestic (48.1% sales on credit) than to foreign B2B customers (32.4%). This likely reflects the relatively closed nature of the Turkish economy. A stronger tendency to grant credit terms to domestic (37.5% of the B2B sales value) than to foreign buyers (30.3%) is also shown by Polish respondents. This may reflect Poland’s strong domestic market. Respondents in the other countries surveyed in Eastern Europe appear to be almost equally likely to sell on credit terms to domestic or foreign B2B customers. In the Czech Republic 45.8% of the domestic, and 42.7% of the foreign B2B sales value was made on credit; in Slovakia, 27.0% domestic and 26.4% foreign and in Hungary, 54.7% domestic and 52.5% foreign. 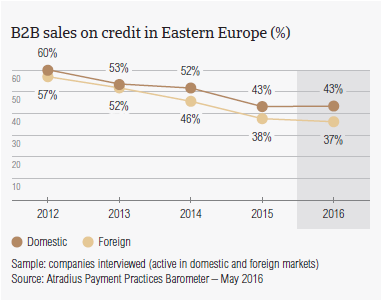 Year-on-year fluctuations in the domestic and foreign credit sales value at country level will be expanded on in the country reports that form this edition of the Payment Practices Barometer for Eastern Europe. 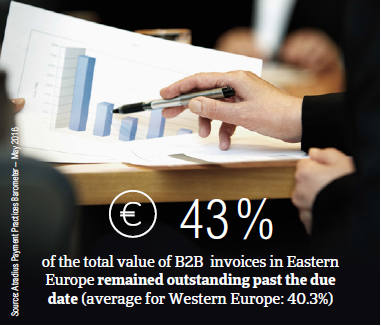 85.2% of the respondents in Eastern Europe (Western Europe: 92.4%) experienced late payment of B2B invoices over the past year. Late payment from domestic B2B customers occurred markedly less often than one year ago. This may reflect more benign business conditions than in past years. Foreign customers, in contrast, paid invoices late almost as frequently as last year. This resulted in an average of 43% of the total value of B2B invoices remaining outstanding past the due date (average for Western Europe: 40.3%). Compared to last year, there was an increase in both the domestic (up 3.8%) and foreign (up 6.6%) payment default rates reported by respondents in Eastern Europe. This may explain why 20.0% of respondents in the region (this percentage is the highest in Turkey at 33.0%, followed by Poland at 27.0%) are concerned about a worsening of DSO over the next 12 months. This could be mainly a consequence of poorer payment practices by respondents’ foreign customers than by domestic ones. The overall picture, however, has to be evaluated in light of the diverse payment default rates observed in the countries surveyed in the region. Despite showing the strongest preference for using trade credit in domestic B2B transactions, Turkey records the highest domestic payment default rate in Eastern Europe. According to 91.4% of respondents in the country, an average of 61.1% of the total value of domestic B2B invoices were paid late (up from 55.2% last year). These findings are reflected in the 63 days average DSO reported by Turkish respondents. This is the second highest DSO observed in the region after that of Poland (71 days) which will be commented on later in the report. Slovakia follows with an average of 53.1% of domestic invoices paid late (up from 47.7% last year), and a DSO averaging 39 days. This latter may reflect the strong aversion to trade credit shown by Slovakian respondents. In the Czech Republic, 37.9% of the value of domestic invoices was paid late, while Hungary had an almost similar percentage (37.6%). The lowest average total value of domestic invoices paid late was shown by Hungary (36.6%, up from 35.5% last year). In this country, late payments were reported by 87.0% of respondents, which is the second lowest response rate in the region after that recorded in Hungary (80.1% of respondents reporting domestic late payment). Based on our survey results, Turkey is the hardest hit country by late payment from export customers. 53.1% of the total value of Turkish export sales on credit (up from 49.8% last year) were paid late. This was reported by 85.2% of Turkish respondents. Slovakia follows with an average of 42.9% of export invoices paid late (up from 37.0% last year). This was reported by 76.5% of Slovakian respondents. In the Czech Republic, 37.2% of the total value of export invoices was paid late (stable compared to one year ago), and in Hungary 35.8% (up from nearly 20.0% last year). At the lower end of the spectrum Poland, with 31.4% of the export invoices’ value paid late (up from 29.3% last year), as reported by nearly 83% of respondents. Surprisingly, Poland is the country recording both the lowest domestic and foreign payment default rates in Eastern Europe, and has the highest DSO in the region. This most likely reflects the proportion of export invoices more than 180 days overdue (14.3% of the foreign receivables’ value). This is nearly three times higher than that recorded in the other countries surveyed in the region. More insights into the frequency of late payment and the total value of past due invoices at local level can be found in the country reports forming this edition of the Payment Practices Barometer. As observed in Western Europe, respondents is Eastern Europe also try to minimize payment risk by keeping the time it takes to turn credit sales into cash as short as possible (around 30 days or less from the invoice date). This is the case for the majority of the countries surveyed, except for Turkey. Here, respondents’ domestic customers enjoy considerably longer terms for settling invoices than export customers(averaging 43 days domestic, and 33 days foreign). This seems to reflect a more lenient payment culture observed on the domestic market in Turkey than in the other countries surveyed in Eastern Europe. 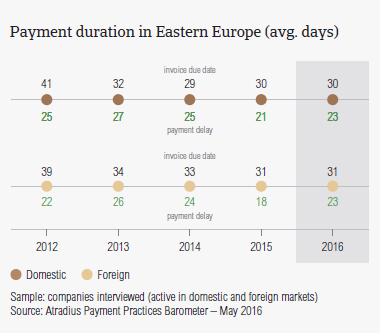 The average payment terms set by respondents in Eastern Europe fluctuated widely over the past year. Respondents in Turkey appear to offer shorter payment terms to both domestic and foreign customers than one year ago (on average four days shorter). This is also the case for respondents in the Czech Republic, where domestic customers are requested to pay invoices three days earlier, and foreign customers one week earlier than last year. In contrast, both domestic and foreign customers of respondents in Hungary and Slovakia are requested to pay invoices, on average, five days later than one year ago. Similarly, export customers of respondents in Poland enjoy more relaxed payment terms than last year (on average three days longer). No variation in payment terms granted by Polish respondents to domestic customers was observed. Despite the attempt to offset slow payments by shortening credit terms, respondents in Turkey have to wait the longest in Eastern Europe to receive payment on both domestic and foreign past due invoices (on average 35 days; three days longer than last year and 13 days longer than the survey average). Both domestic and foreign B2B customers of Hungarian respondents, in contrast, appear to settle past due payments the swiftest (on average within 13 days of the due date; survey average 22 days). In spite of this, Hungarian respondents now have to wait, on average, one week longer than last year to receive payments on past due invoices from export customers. 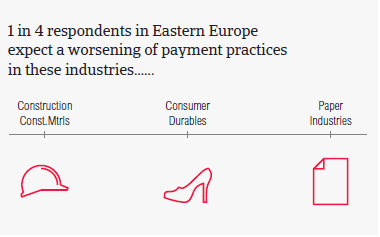 This is the longest foreign payment delay observed across the countries surveyed, which suggests a clear worsening of the payment practices of Hungarian respondents’ export customers. In all the other countries surveyed in Eastern Europe, respondents have to wait an average of around three weeks for past due invoices to be settled. This payment delay is the same as that observed in Western Europe. As it was observed in Western Europe, respondents in Eastern Europe reported insufficient availability of funds as the main reason for late payment from both domestic and foreign B2B customers. 64.4% of respondents (up from nearly 60.0% last year) reported this in respect to late payment of domestic invoices, and nearly 40.0% (stable compared to last year) in respect to late payment from foreign customers (respondents in Western Europe: 57.9% domestic and 40.2% foreign). Domestically, as observed last year, respondents in Hungary appeared to be the hardest hit by late payment of invoices due to customers’ insufficient funds (75.7% of respondents, down from 78.6% last year), followed by those in Slovakia (72.8%, down from 73.5% one year ago). In Poland, the percentage of respondents was 63.5% (up from 57.6% last year), and in Turkey 66.1% (up from 57.5% one year ago). Respondents in the Czech Republic, in contrast, reported this reason the least often, however a lot more frequently than last year (47.0% of respondents, up from 39.2% last year). Late payment from foreign customers due to liquidity issues is most acutely felt in Hungary (65.7% of respondents), followed by Slovakia (54.7%). The least impacted in this respect are respondents in the Czech Republic (24.4%). 32.7% of respondents in Eastern Europe (down from 34.8% last year) said that domestic B2B customers intentionally use outstanding invoices for financial advantage. This is a more widely-held belief in Eastern than in Western Europe, where this reason was cited by 27.0% of respondents. In Eastern Europe, respondents in the Czech Republic seem to be the most convinced that domestic customers intentionally pay slowly for their financial advantage (46.5%, down from 57.8% last year), followed by those in Poland (39.6%, up from 37.0% last year). In contrast, the least convinced about this delay factor are respondents in Hungary (nearly 15%, stable compared to last year). Interestingly, as observed in Western Europe, intentional slow payment of invoices for financial advantage is more often a concern with domestic than with foreign B2B customers. These latter appear to pay invoices late very often due to external reasons that are independent of their creditworthiness, such as the complexity of the cross-border payment procedure. Czech respondents (36.4%, stable compared to last year) reported this the most often, followed by respondents in Turkey (31.3%, up from 28.0% last year). Respondents in Slovakia seemed to be the least concerned about this (6.3%, up from 3.6% last year). 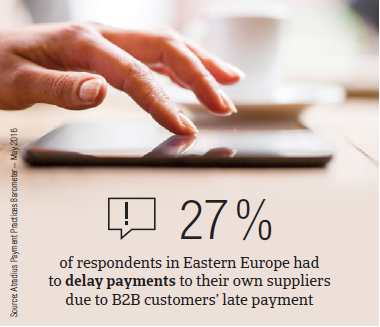 Late payment of invoices from B2B customers caused 27.2% of respondents in Eastern Europe (above the 23.7% in Western Europe) to delay payments to their own suppliers. The most impacted in this respect were respondents in the Czech Republic, Slovakia and Turkey (around 30.0% each). 18.6% of respondents in Eastern Europe had to take specific measures to correct cash flow (same percentage in Western Europe), and 17.2% reported revenue loss (18.8% of respondents in Western Europe). This was experienced by the most respondents in Turkey (40.0% corrected cash flow and 30.0% lost revenues). Interestingly, slightly more respondents in Eastern Europe (12.0%) than in Western Europe (9.0%) reported that they defaulted on payments to their suppliers, and nearly 11.0% (7.6% in Western Europe) said their business stopped growing. Again this was of great concern for respondents in Turkey (around 15% for both kinds of impact). To protect business profitability from the impact of customers’ late payment, around 44% of respondents in Eastern Europe reported they will not change their current mix of credit management tools (respondents in Western Europe: 45.0%). However, around 25% will check the creditworthiness and payment history of their customers more often, and will more frequently monitor customers’ credit risk over the next 12 months (respondents in Western Europe: around 32.0%). Czech respondents (around 35%) seem to be the most likely to increase customers’ creditworthiness and payment history checks while Turkish respondents (31.0%) seem to be the most likely to increase credit risk monitoring. On a country basis, the mix of credit management tools varies notably and will be expanded on in the various country reports. Despite the various approaches to credit management observed in the surveyed countries, respondents in Eastern Europe appear to have a uniform perception of the main challenges to business profitability they will be facing this year. Most of the respondents in the region consider maintaining adequate cash flow and cost containment (Slovakian respondents being the most concerned, around 25.0%, survey average 17%) as well as falling demand for their products and services (concerning Czech respondents the most, around 30.0% versus 17% survey average) to be the main challenges they will be confronted with in 2016. 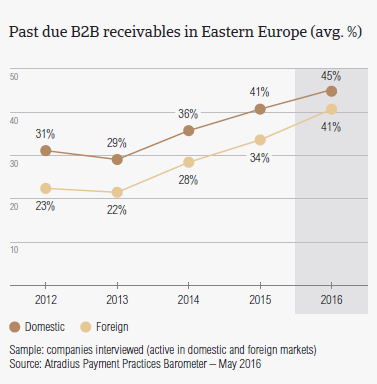 On average 1.2% (stable compared to last year, and compared to 1.3% in Western Europe) of the B2B receivables of respondents in Eastern Europe was written off as uncollectable. 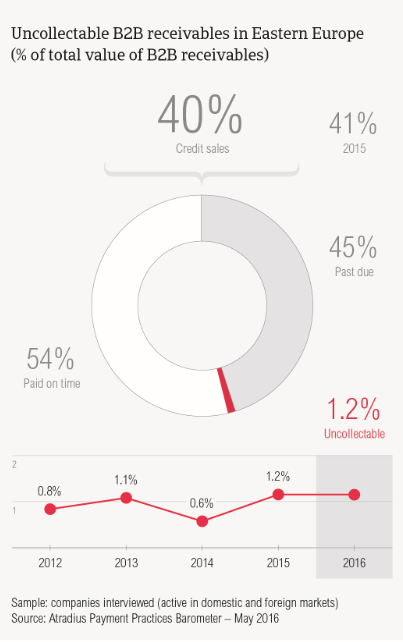 In Turkey, the proportion of uncollectable receivables is nearly twice as high (2.2%, compared to 2.0% in 2015). In the Czech Republic it is 1.4%, in Poland 1.2%, and in Hungary and Slovakia it is less than 1%. Uncollectable receivables, in Eastern Europe, come mostly from the construction industry. Based on survey responses in Eastern Europe, B2B receivables were reported to be uncollectable mainly due to the customer being bankrupt or out of business (54.7% of respondents, down from 56.6% last year). This compares to 59.3% of respondents in Western Europe (down from 66.4% last year). Although less frequent than last year, this reflects the still difficult business climate in which businesses operate. 33.0% of respondents (29.0% in Western Europe) reported that write-offs were due to the failure of collection attempts. For around 20.0% of respondents in each case, write-offs were due to the fact that the customer could not be located, the debt was too old, or the additional costs to pursue the debtors were too high. Respondents in Eastern Europe granted the most relaxed payment terms (around 15 days longer than the regional average of 30 days) to B2B customers in the metals sector. The payment terms extended to B2B customers in the construction materials sector are nearly 10 days more than the regional average. B2B customers in the services sector enjoyed less lenient terms (around 10 days shorter than the average for the region). The largest proportion of past due payments in Eastern Europe was generated in the construction materials sector (60% of the total value of B2B receivables were paid late). Late payment from B2B customers due to liquidity issues was reported to occur most often in the food and machines sectors (around 60% of respondents). Intentional use of outstanding invoices for financial advantage was most often reported in respect to the payment practices of B2B customers in the construction industry (around 40.0% of respondents). The slowest payers are B2B customers in the construction materials sector, as it took them on average one month past the due date to settle overdue invoices (compared to the three weeks survey average). 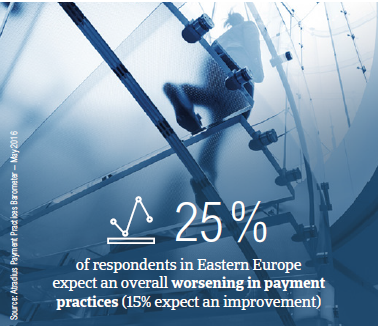 Nearly 60% of the respondents in Eastern Europe expect no significant change in the payment practices of B2B customers in the industries they do business with. However, a slight deterioration is anticipated by around 10%. There are more respondents expecting a deterioration (25.0%) than an improvement (15.0%). This is mostly the case for B2B customers in the construction, construction materials, consumer durables and paper industries.